People always think about their house, bank accounts and car when preparing their Will but no one thinks about their pets. The poor creatures who depend on us for so much are often forgotten and can be left without a home or money to look after them. 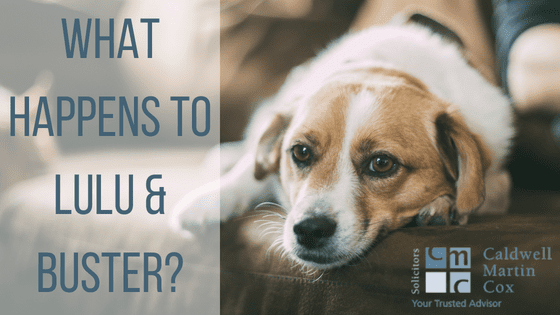 Creating a Trust for your pets to cater for their future needs. Providing money to a charity in consideration of them caring for your pet when you pass. Leave your pet to a friend/family member together with a sum of money on the condition that they care for your furry friend. Creating an Advanced Pet Directive to ensure the proper ongoing care arrangements for your pet.